That’s TV is a leading local television network, owned by That's Media Ltd and operating multiple city-based stations across the UK. Operational since 2012, That’s TV has rapidly expanded its licenses, recently adding services in Scotland and the Humber. 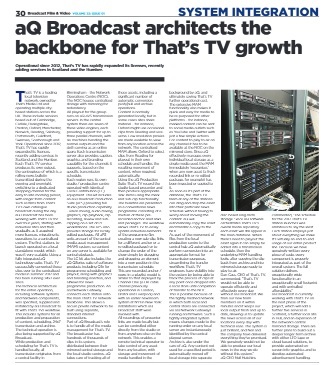 aQ Broadcast worked with That’s TV to migrate its operations to a centralised system which you can learn all about in the January 2019 issue of Broadcast Film & Video available to download here. aQ Broadcast announces the launch of QScript.app, a mobile version of the award-winning QScript which provides script and rundown information to on-air presenters.